Michelle Obama has taken time out from telling us to eat celery sticks while she and Barry chow down on kilbasa and potato skins to give us some Valentine’s Day advice. So get out there and laugh today, damnit. It’s hard to believe Maureen Dowd and her brother, Kevin, came from the same womb. She hands her column over to him today and it is a delight. As a semichastened Barack Obama appeared at the press conference following the election, he conjured up the image of the curtain opening in “The Wizard of Oz,” revealing a little old man working the controls, not the great and powerful Oz. The voters left no doubt about their feeling for his super-nanny state where the government controls all aspects of their lives and freedoms. Warning signs were up in the three elections held in Massachusetts, Virginia and New Jersey and with the noisy birth of the Tea Party. But the president, swathed in the protective cocoon of adulation and affirmation from the media and his own sycophants, soldiered on in his determination to turn our country into just another member of the failed European union — France without the food. I recommend a full reading. Not only is he on the right side politically, but he is a much better writer. Linked at The Blogmocracy. Thanks! 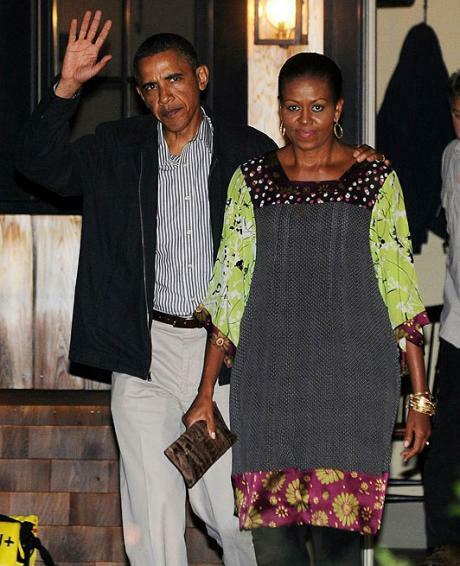 OK so this might be a shallow post, but it’s the weekend and I’m feeling catty and I can’t help but notice that whenever Barry is allowed to pick out his own clothes, it’s almost always a fashion fail. First, black jeans have been out since the millennium. Second, the high waist with the tightly cinched belt screams dork. Third, tucking the golf shirt into a pair of jeans is also a foul on the play. Fourth, the offending jeans are floods. And finally, pairing jeans and sneakers should be illegal. I’m starting to think the man has chicken legs and this is why he refuses to wear shorts in public. If that’s the case, someone needs to get the man a pair of wind pants. And don’t get me started on Michelle. Update: Mr. loppyd has scolded me for my sneakers and jeans comment. He thinks it’s generational. Since it’s Sunday and I’m feeling charitable, I hereby declare that jeans and sneakers on a man under 50 should be illegal. Michelle Obama’s let them eat cake moment did not sit well with the American people she and her golf-obsessed husband claim to be just like. After a widely admired start in the White House, first lady Michelle Obama’s popularity is falling and, if the current downward trend in her approval ratings continues, could touch lows not seen since the scandal-tainted days of Hillary Rodham Clinton. In the new Wall Street Journal/NBC News poll, 50 percent of those surveyed say they have a positive opinion of Mrs. Obama. That’s down from 64 percent in April 2009 and 55 percent in January of this year. The first lady’s positive rating is barely ahead of her husband’s personal approval figure, which stands at 46 percent in the new poll. The survey was taken from Aug. 5-9, which happened to coincide with Mrs. Obama’s vacation in Spain, where she, along with daughter Sasha and several friends, stayed in a posh five-star resort. It was a luxurious getaway for the first lady of a nation with nearly 10 percent unemployment and widespread economic anxiety, and it fed an image of extravagance that Mrs. Obama has created by, among other things, patronizing chichi restaurants and wearing $775 boots to break ground at her White House garden. 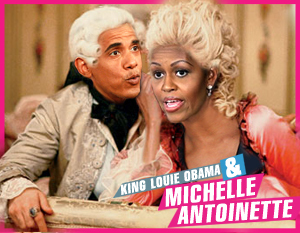 A new name — “Michelle Antoinette” — was born. The first lady’s falling numbers stand in opposition to the still-strong belief among some Washington political insiders that she will be a big asset for Democrats on the campaign trail this fall. After the Spain trip brought the first extended bad press of her time as first lady, the White House, and some of its allies in the press, pushed back by claiming Mrs. Obama will still be much in demand. News accounts suggested her “sky-high popularity,” her role as “cultural and fashion icon” and her “incredible force” will boost Democrats across the country. Now, with the Wall Street Journal/NBC numbers, that’s not so clear. Mrs. Obama’s ratings are decidedly different from predecessor Laura Bush. In December 2001, as George W. Bush’s popularity soared after the 9/11 attacks, Mrs. Bush’s positive rating stood at 76 percent in the Wall Street Journal/NBC News poll. Nearly four years later, in 2005, it was 65 percent. Still later, when President Bush’s job approval rating hit bottom, Mrs. Bush fell briefly to 54 percent — still above where the current first lady is today. 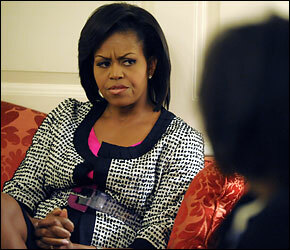 Poor, misunderstood Michelle will have to lick her wounds for ten days on this humble Martha’s Vineyard estate. But not until he will not rest in Bar Harbor, Maine this weekend. 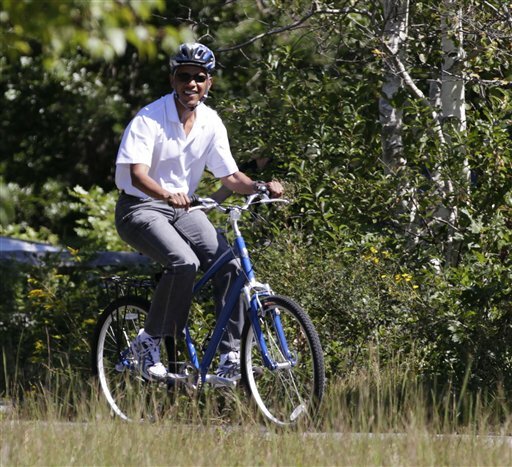 President Obama, his poll numbers tanking, will return to Martha’s Vineyard – the most Democratic spot in the bluest of blue states – for his summer vacation next month, island sources said. 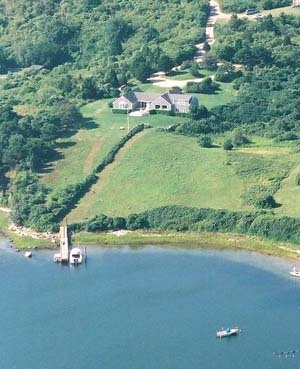 Our spies on The Rock report that the first family will return to Chilmark’s Blue Heron Farm for about 10 days in August. “It’s the same deal all over again,” said our source. The White House declined to confirm the report, saying the prez’s schedule “cannot be confirmed” at this time. But the big buzz on the Rock is that the commander-in-chief, Michelle and the girls, Sasha and Malia, will return to The Rock about Aug. 19. And why wouldn’t they? The fab farm where the first family beaches themselves has a basketball court for Barry, and the prez was greeted like a rock star everywhere he went. And with his approval ratings at an all-time low, a little love from the locals can’t hurt. But what about the first lady’s plea to Americans to vacation in the Gulf region to help the oil-ravaged area and “send a different message about the extent of the spill”? 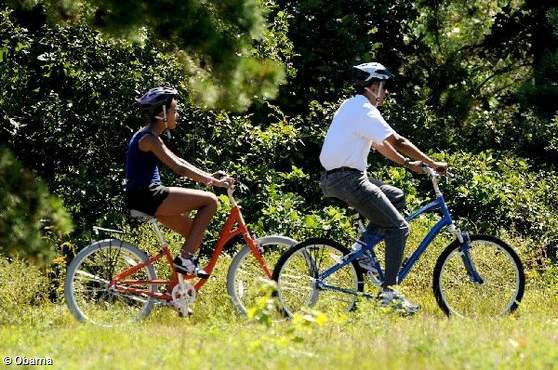 Apparently it’s yet another case of presidential do-as-I-say-not-as-I-do, because tomorrow the Obamas will head north to recreate on Maine’s Mount Desert Island for three days. And, come August, the only oil slick that will be causing the president agita will be from the fried clams at Nancy’s in Oak Bluffs! Barry and Michelle need some love and there is no better place to bask in the Kool-Aid glow than with the Beautiful People of Martha’s Vineyard. The Secret Ingredient? Michelle’s Veggies. Iron Chef America is coming to the White House and the celebrity chefs will be using ingredients found in the most over-hyped vegetable garden evah. The Food Network announced today that an episode of “Iron Chef America” will be taped at the White House featuring Mario Batali, Bobby Flay and Emeril Lagasse. The three chefs, joined by White House chef Cristeta Comerford, will be welcomed by the first lady and allowed to use anything found in the garden to help create their meals. The competition will then move back to the network’s Kitchen Stadium in New York, where Flay and Comerford will face-off against Batali and Lagasse to produce five dishes showcasing the ingredients. Michelle is thrilled at the chance to wear her favorite apron for the taping. I think I just saw a flying pig over Morrissey Boulevard. Acting as if he were head of the Chicago chamber of commerce, not the leader of the United States, President Obama is traveling hat in hand to meet with the International Olympic Committee in Copenhagen today. He’s pushing for his hometown to host the 2016 Games. In case the judges aren’t dazzled by him and his wife, Michelle, he’s got Oprah Winfrey to help seal the deal. Chicago has much to gain from the Olympics, and no doubt all Americans would love to see the Games on US soil. Obama may help deliver the prize. But he risks diminishing the prestige of his office by mobilizing it behind this narrow cause. And it seems at least possible that some judges will feel so put off by his hard sell that they’ll opt for one of the other finalists. Obama gained support during the presidential campaign by staying cool amid an economic meltdown, while John McCain marched into Washington in an attempt to show a spirit of action. 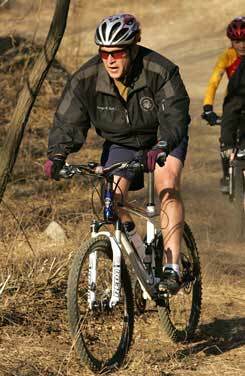 Instead, McCain showed his futility. Americans don’t like to see their leaders appearing rash or weak. If the Olympic committee rejects the president, Obama becomes just another failed salesman. It’s a mistake for him to sink so much into a cause that may not even need his help. He should have stayed home. Doesn’t the editorial staff at the Globe understand the supreme sacrifice Michelle and Barry made by jetting to Copenhagen with makeup artists, stylists, handlers, personal chefs and the other O – as in Oprah? UPDATE: The salesman in chief failed miserably.